So, it’s been awhile since I shared a chocolate dessert on the blog, and I wanted to make up for that with this ridiculously over the top bursting with chocolate Reese’s Triple Chocolate Bundt Cake. Okay, who am I kidding? I just posted a Chocolate Samosa recipe on Friday :p . BUT that was a respectable amount of chocolate in a dessert. 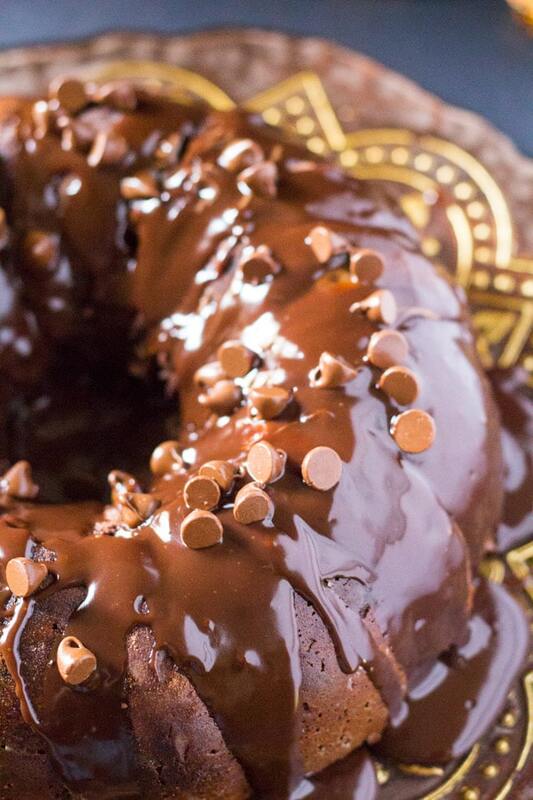 This Reese’s Triple Chocolate Bundt Cake, however, let’s just say that it’s lost all sense of what is a respectable amount of chocolate allowed in a dessert. And let’s admit it, the best kind of chocolate desserts are those that are practically just made of all chocolate, chocolate aaaannnd even more chocolate. Okay, please don’t think I’m mad or anything for going and adding so much chocolate to just one cake. Hear me out, first. This is the kind of chocolate cake that you find at dessert shops, quaint little cafes or coffee shops. It almost reminds me of Starbucks’ Chocolate Lover’s Cake, because it’s VERY close to it in taste and texture. It’s so full of chocolate flavor, and the chocolate pudding mix gives it a very moist texture to it. The mini Reese’s add a nice chocolatey peanut buttery pockets in the cake and the peanut butter gives a little salty sweetness to the cake. 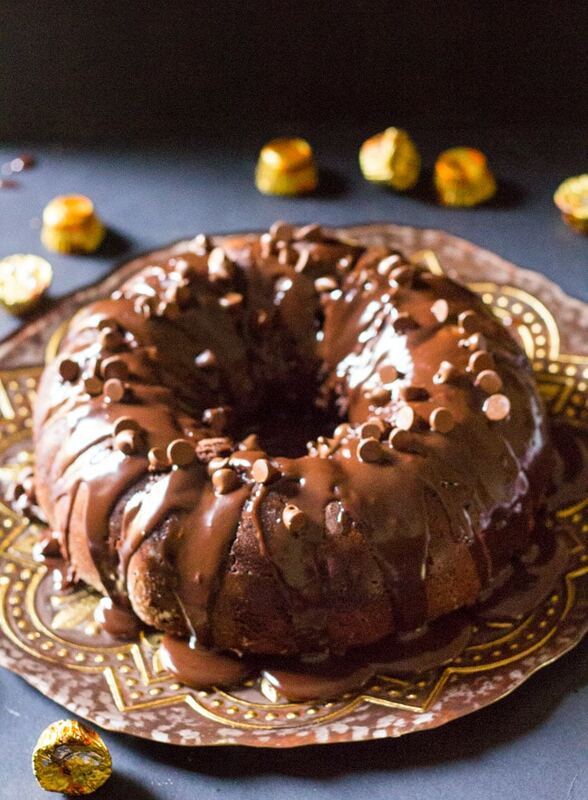 This Reese’s Triple Chocolate Bundt Cake is SO easy to make (ugh, I know I repeat the word easy like a parrot in each of my recipes, but it’s true). There are however a few tips that I would love to outline for you as it would make the whole cake baking experience for you! 1.) Make sure you grease the bundt cake pan very well. And then dust it with 1 teaspoon of flour or cocoa powder. This is to ensure that the cake does not get stuck when removing from the pan. 2.) Buttermilk is essential in this recipe, don’t skip it. If you don’t have buttermilk at home, just make the homemade version which is: 1 cup milk + 2 tablespoons white vinegar stirred together. Let this stand for 1-2 minutes until it appears curdled. Your buttermilk is ready to be used. 3.) This cake requires only the DRY mixes: a chocolate cake mix and a chocolate pudding mix. Do not use the ingredients listed on the back of the packages. Only the ingredients I’ve listed in the recipe card below are the ones that go into the batter. 4.) Make sure your eggs are room temperature as they are easily incorporated with the rest of the ingredients while making the batter. An easy way to quickly bring eggs to room temperature is to place them in hot water for 10 minutes or so. 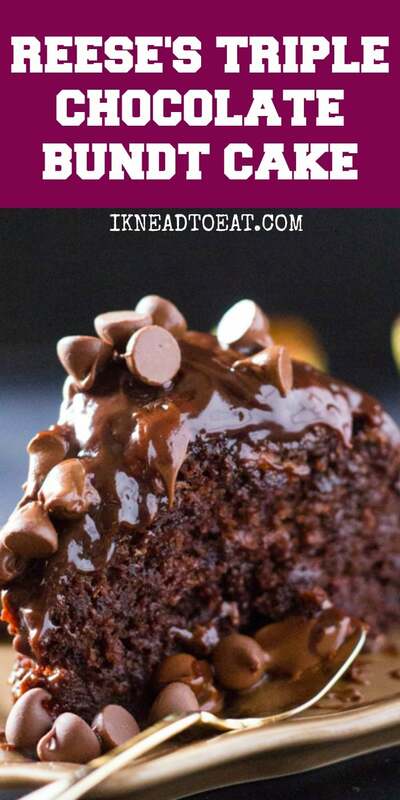 Okay so that’s about all of the tips that I could think of to help you make the perfect Reese’s Triple Chocolate Bundt Cake. Marsha from Marsha’s Baking Addiction is the newest member of YOTM and she chose this month’s theme of bundt cakes! 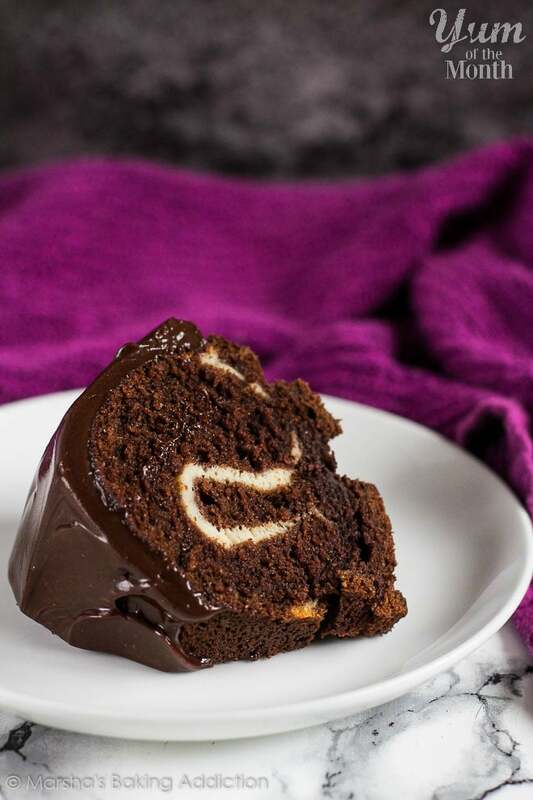 Here’s her fabulously delicious Cheesecake Swirl Chocolate Bundt Cake. 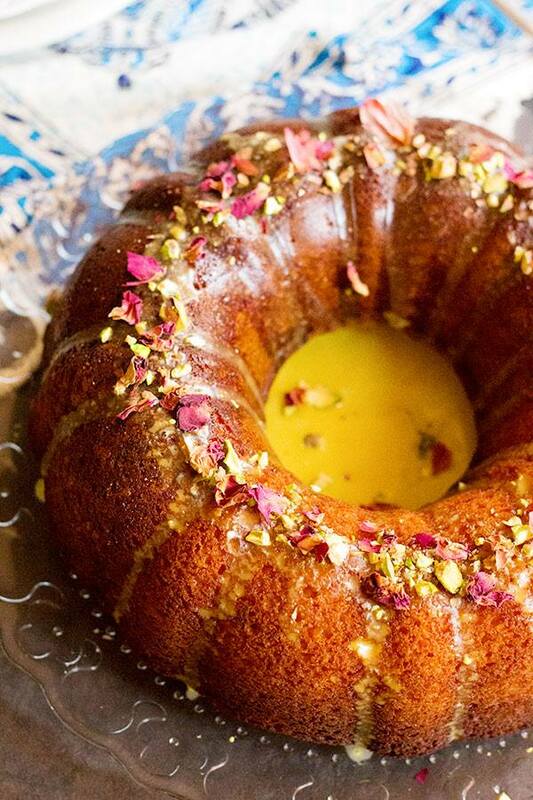 I’m loving this Persian Love Bundt Cake by my dear friend Shadi from Unicorns in the Kitchen! 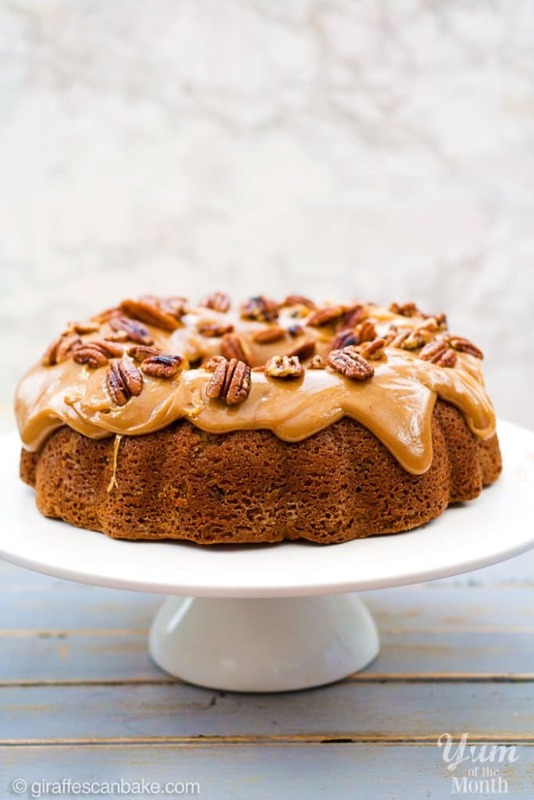 And here’s a mouthwatering Brown Sugar & Pecan Bundt Cake from Michelle at Giraffes Can Bake. It’s gluten free too!! 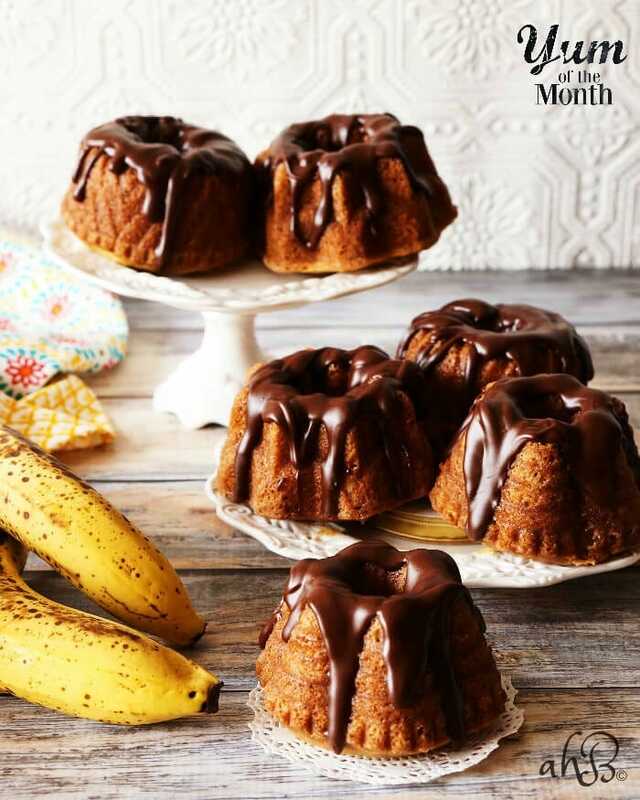 I’m loving these Mini Banana Bundt Cakes from Amy at Accidental Happy baker! 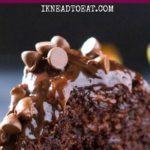 This triple chocolate bundt cake stuffed with Reese's is so super moist, full of chocolate flavor and delicious. Made with cake mix and pudding mix it's super easy! Preheat the oven to 350 F / 176 C. Prepare a 10 inch bundt cake by greasing it well, and then dusting it with a teaspoon of flour or cocoa powder. In a large mixing bowl, add all the ingredients for the batter except the Mini Reese's: chocolate cake mix, chocolate pudding mix, buttermilk, eggs, and water. I used a wooden spoon to mix all of these ingredients pretty thoroughly until they were fully combined. You can use a hand held mixer if you want. Fold in the chopped Mini Reese's and then pour this batter into the prepared bundt cake pan. Bake for about 45-50 minutes until a toothpick inserted comes out mostly clean. While the cake is baking, make the chocolate ganache. In a microwave safe oven, combine the chocolate chips and heavy cream. Heat in microwave in 10 second intervals, making sure to take out the bowl every 10 seconds and stirring through. This is to ensure that the chocolate won't burn. As the heavy cream heats, it will help the chocolate chips melt so this only takes about 30 seconds or so. After it's ready, set aside the chocolate ganache. Drizzle with chocolate ganache, and garnish with Mini Reese's or chocolate chips if using. For homemade buttermilk: Measure out 1 cup of milk, and add 2 tablespoons white vinegar to the milk and mix. Let stand for 2-3 minutes until the milk appears curdled. Your homemade buttermilk is ready to be used. Removing the cake from the bundt pan: It is important to let the cake cool to room temperature in the pan. I took the cake out too soon (because I'm impatient and also wanted to make the video) and as a result it slightly cracked on the top. I was able to cover it with chocolate ganache, but I would suggest being patient and letting it cool completely before removing from the pan. I also suggest flipping it out directly on the platter or dish you want to serve the cake on, as it can be difficult to move the cake to another dish without cracking it. An unreasonable amount of chocolate is just the right amount for me! This cake is amazing! I adore chocolate and peanut butter! Must try this cake!! 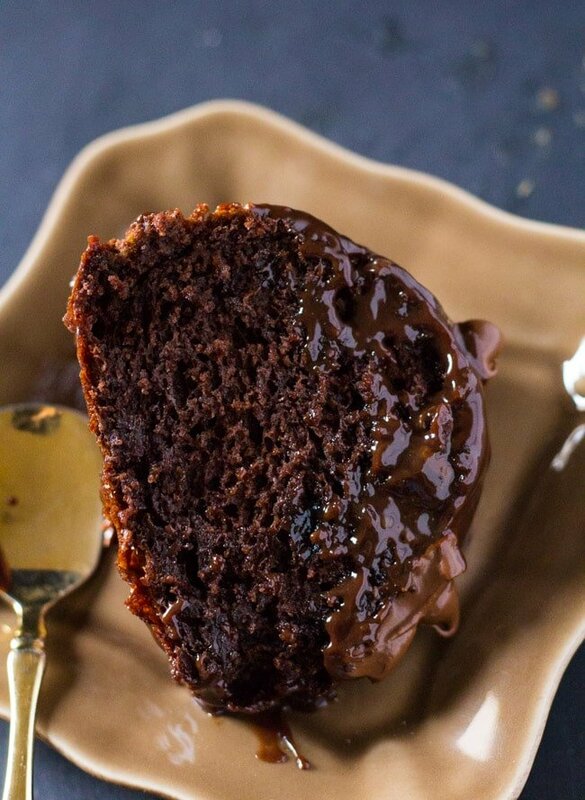 That Ganache and that cake is just calling my name, I really wish I lived close by! I love pudding in my cakes- it makes them so moist! Pass me a slice of this! You’ve got all the goods in this cake. Chocolate, Reeses, and ganache? How could anyone resist. I know, right? My husband’s work colleagues were raving about this cake! This looks incredible! And the cracks are just more room for the chocolate settle! Yum! 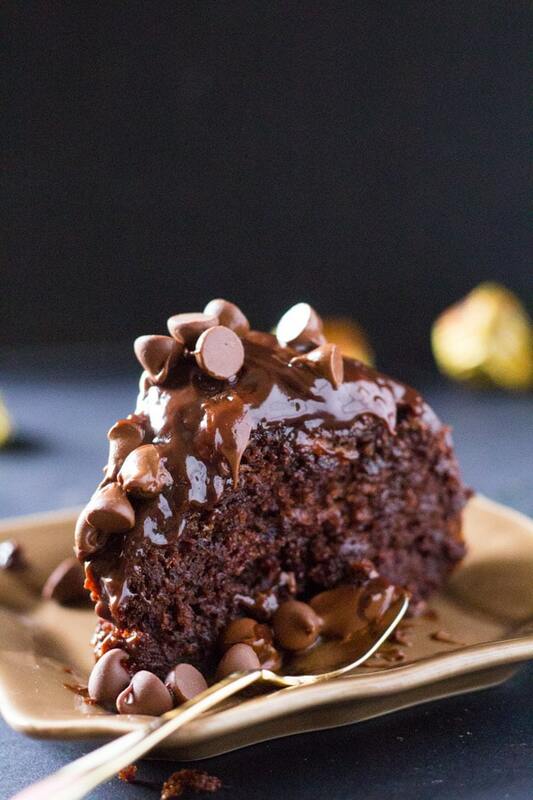 What a rich and stunning chocolate cake! This cake turned out exceptionally well. I added a half extra cup of heavy cream by accident and thought it wouldn’t bake all the way through but it did and the cake was truly decadent. How much oil did you add to the cake? In the directions it says to add oil but no oil is specified under the ingredient list.